"The sums involved are so minuscule, they're not even insulting: they're *quaint* and *historical*, like the WHISKEY 5 CENTS sign over the bar at a pioneer village. Some writers do make it big, but they're *rounding errors* as compared to the total population of sf writers earning some of their living at the trade." In Part One, I gave an overview of the situation. Part Two discussed emusic. This time I'll cover ebooks. 1. The traditional publishing business is incredibly inefficient. It absorbs most of the dollars paid for a book before they get to its creator. That reduces our favorite authors' incentive to write more books. Consolidation and other changes in publishing are limiting the availability of books and short stories. Ebooks could theoretically solve all of these problems. 2. People have been predicting the imminent takeoff of a mass market for ebooks since the late 1970s. It didn't happen then, and it's not happening now. 3. Unlike emusic, there are major structural barriers to the broad adoption of ebooks. The problem is not just technological. The most important barrier is a chicken and egg situation: People won't buy an ebook reader until there are millions of ebooks available for it, but there won't be lots of ebooks available for an ebook reader until it has millions of users. 4. Until we break that logjam, the mass market for ebooks will never develop. I should start with a little background. I'm passionate about publishing, and have been since I was a kid. In high school I hung out in the print shop, doing everything from hand-setting type to running a clanking old Linotype machine that cast lines of type from molten lead. I think the Linotype machine was one of the most impressive purely mechanical devices ever created. It had to deliver molds for every letter as quickly as the operator typed them, space them properly, send the finished line of text over to the caster, inject the lead, eject the finished line of text, and automatically sort all of the molds back into their proper positions for re-use. None of this was computerized – the operator typed on a mechanical keyboard and yanked a lever to start the caster, whose actions were then automated by a fantastic array of gears, pulleys, and levers. The molds for each letter had a unique set of notches on them, which allowed them to be sorted automatically by a series of gravity-fed chutes and cogs. A Linotype machine in full operation was a symphony of noise – the clacking of the keyboard (the best operators typed fast), the clank and whir of the caster, and a fantastic tinkling sound as the little brass molds ran through the sorter. You can see video of a Linotype machine in operation here. Man, I wish I had one of these things in my garage. 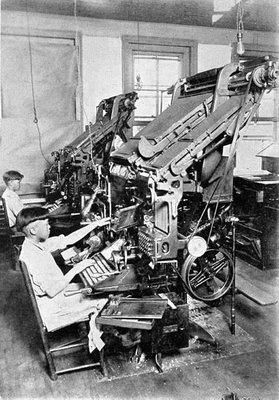 The most dramatic thing about running a Linotype machine was that if you sent over a line of text that didn't have enough letters or spaces in it, the machine might shoot hot lead straight out between the molds, where it would splash all over the place, including the operator's left arm. This was called a "squirt." I remember diving for the floor more than once when I realized I had accidentally sent out a line of text with the wrong spacing. It was a pretty cool school district that let a teenager run a complicated and dangerous machine like this. This boy isn't smiling, but I guarantee he's having fun with his Linotype machine. In college I spent five years on the campus paper as it transitioned from typewriters to CRTs, and after graduation I started a desktop publishing company that made the first downloadable PostScript fonts for the Macintosh. In 1999 I spent time as the acting VP of marketing for SoftBook, a company that was making electronic books. And now here I am publishing my own writing online. The most exciting thing about all of this technological change (other than the part about flying molten lead) has been the promise that publishing would become more democratized and more accessible to everyone. In some ways it has happened – desktop publishing paired with Kinko's and the photocopier made it much easier and cheaper for people to print on paper. And the Internet has spawned an unimaginable explosion of commercial and self-published media. Yet in many important ways the revolution is incomplete. Books are still generally published through the same business processes used a hundred years ago. The distribution system is so inefficient that it absorbs almost all of the revenue paid for a book, and it's still a struggle for first-time authors to get paid for their work. "IDC said that the U.S. e-book market would grow from $9 million in 2000 to $414 million in 2004, and Forrester Research predicted a revenue increase from $383 million in 2000 to $7.8 billion (!) in 2005. These are large numbers indeed, and the ... market research firms companies making them are well known in their field... To be fair, these numbers may apply to print-on-demand as well as e-books. (But) it is now apparent that the e-book shot missed its mark, and the e-book revolution has fizzled. Indeed, it never really got off the ground. The marketplace did not develop as originally predicted." He wrote that in 2002, but the situation isn't much different today. Despite decades of effort, and numerous failed startups like SoftBook, we're still generally using an inefficient old publishing model that would feel familiar to Ben Franklin. How could so many smart people all be so spectacularly wrong? The economics of book publishing today: "You don't write a book to make money"
That's the consensus from everyone I know who's involved in the publishing business. When you look at the economics of book publishing, it's easy to understand why they say that. For hardcover books, an author typically gets 10% to 15% of the retail price, depending on how many copies are sold. For paperbacks, the royalty rate is 4-8%. An agent will take about 15% of those royalties off the top. There are good summaries here and here. That means if you write a hardcover book that sells for $30, you'll probably get about $3 to $4.50 per copy sold. If you write a paperback that sells for $7, you may get about 42 cents per book sold. This ought to make it very attractive for an author to sell e-books direct rather than going through a print publisher. Let's assume the cut taken by an e-book reseller would be similar to Apple's iTunes cut – 30%. If everything else is equal, you'll make the same amount of cash selling 1,700 e-books as you will selling 10,000 print books. So the tipping point in book publishing comes when about 17% of the book-buying public purchases e-books rather than paper. Advances. In most cases, an author gets a non-refundable advance when the book is accepted or published, and no more royalties are paid until the advance has been covered by sales. The advance can range from a few thousand dollars for a first-time author to much more for an established author whose book sales are more predictable. This means that in many cases the royalty percentage is merely an academic exercise – what really matters is the size of the advance. Publishers sometimes use the advance as an investment mechanism. They may deliberately pay an advance greater than the expected royalties on the first couple of books by an author they believe has great potential, in the hope that they'll eventually get a very profitable bestseller (there's a very good discussion of the process here). On the other hand, if a book is expected to do well in sales and fails, the disappointment over that might get the author blacklisted throughout the industry. Price of the book. This one works against e-books. Most people buying a book, especially a hardcover, feel they're getting an object of tangible value. A hardcover book has heft to it, the pages have a nice texture, it has a pretty color, and it makes you look educated when you put it on a shelf (unless it's a book by Yann Martel, in which case you just look mildly befuddled). An e-book is ephemeral. It's just a bundle of bits. You might erase it accidentally, and you can't display it on a shelf. Although it can be more convenient to carry an e-book than a paper book (you could hold thousands of books on a single USB drive), that isn't enough compensation for most people. Based on what I saw at SoftBook, no one other than an enthusiast will be willing to pay hardcover pricing for an e-book. Paperback pricing, maybe – but that's the upper limit. This changes the tipping point for some authors. If you're successful enough to be published in hardcover, chances are you're getting the high end of the royalty range, and your book might sell for $30 a copy. You probably get about $4.50 per book, or about the same as your total revenue per book if you self-distribute an e-book at paperback prices. So for these authors, the tipping point is harder to map. I start to wonder about weird hybrid distribution models, in which successful authors publish first to hardcover paper books, and then the ebook takes the place of the paperback. Investment by the publisher. This one's less of a factor than you might expect. The public image of publishers is that they carefully select and nurture authors, editing and marketing them like a jeweler carving a diamond and setting it in gold. That does happen sometimes, but the reality is that the big publishers deal in volume. They publish thousands of books a year (ie, tens of books every single day). How much time is available to coach and edit all of those authors? And how much marketing budget is available? The answer to both questions is, "not much." Publishers don't actually market books, for the most part. They look for books that will market themselves. The reality of modern book publishing is almost like digging for gold – you toss a lot of dirt and gravel into the sluice, hoping to find an occasional nugget. Since it's hard to predict where the gold will be, it doesn't pay to be picky about what you shovel. Just throw in as much dirt as you can and trust that the law of averages will eventually reward you. Translating that metaphor back to publishing, the bookstores are the sluices, and the dirt is the flood of new books that publishers shovel through the stores. If a book starts selling well on its own, that's gold and the publisher makes money. If not, there's another ten books coming out tomorrow. A publisher who believes in a new book may pay a little extra to give it a fancy cover, or place a small ad for it somewhere. But that's about the limit; otherwise, the market rules. The book and author have to sink or swim on their own. There's a fantastic discussion of book publishing economics here (thanks to Lee Fyock for pointing it out to me). The most important takeaway from that discussion is that the publishers aren't getting wildly rich off this system. Most of the money is absorbed by various inefficiencies and expenses unique to printing: writing off the production cost for returned or unsold books, editing and typesetting, shipping, and so on. So most of the value added by publishers is logistical – they manage the complicated production process, get the book placed in stores, handle returns, and so on. If the printing and bookselling process is bypassed, the value-add of most publishers goes away. And so, perhaps, does the publisher. Where's the tipping point? Netting out all the pluses and minuses, my guess is that the tipping point comes when about 20 percent of the book-buying public switches to e-books. 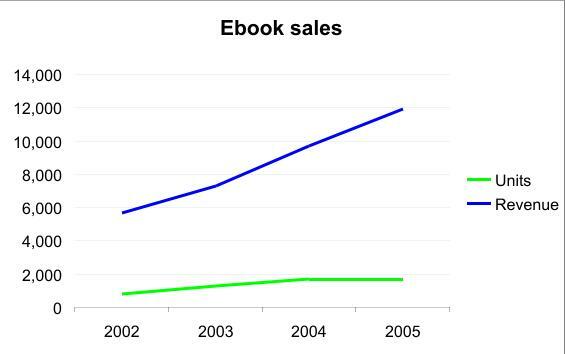 Once we hit that point, ebooks will take over the majority of new book sales quickly. I want to emphasize the 20% figure is just a guess, though. There are so many variables that we won't know exactly when we've reached the point until we're already past it. When will we hit magic 20% adoption rate for e-books? It could be a long wait. The fragmentary statistics available on ebooks indicate that the market's still extremely small and is not growing explosively. A trade organization called the International Digital Publishing Forum (formerly the Open eBook Forum) compiles statistics from about 15-20 ebook publishers, and issues occasional press releases about the results. I created the chart below based on IDPF's press releases. I had to extrapolate the totals for 2002 and 2003 because the forum released only first half statistics. The other drawback of these statistics is that the base of publishers reporting sales has changed over time, but the numbers were not revised to account for that. The numbers show publishers' ebook unit sales and revenue growing about 30% each year. About 1.6 million units were sold in 2005, and revenue was about $12 million for the year. Unit sales were flat from 2004 to 2005, but revenue increased because the average selling price per ebook rose from about $5.70 to $7 (remember, that's publisher's revenue, not necessarily what the user paid for the book). Curiously, the number of new ebooks published has remained steady since 2002 at about 5,000 per year. Units and dollars in thousands. That sounds impressive in the abstract, but compare it to the printed book business. There were about 175,000 print books published in 2004, according to a trade group called the Book Industry Study Group. About 2.3 billion books were sold. Publisher revenue from book sales was about $43 billion, ($28.6 billion from major publishers, and $14.2 from small and specialty presses). You can add to that about $800m to $2.2 billion in used book sales, depending on which authority you believe. Don't get me wrong, I know some people are having a great time reading ebooks, and that's wonderful. I was a big promoter of ebooks for Palm OS when I worked at Palm. But the question I'm asking right now is when they'll displace paper books and transform the publishing industry. From that perspective, the reality is that ebooks are about three one hundredths of one percent of the book market today. They're a hair on a wart on an elephant. At the current growth rates for both markets, we'll hit the tipping point for ebooks in spring of the year 2032. That's well past the date when Ray Kurzweil says we'll all transcend to cybernetic superhuman form. At current course and speed, we'll all be reading books by direct absorption before ebooks hit the big time. Before I get into a discussion of why ebooks aren't growing quickly, I want to mention several other troubling trends in the book industry that electronic publishing might help to address. Consolidation: Reduced diversity. Like the music industry, book retailing is being hit by consolidation as discount retailers like Wal-Mart, and chains like Barnes & Noble, skim off the most profitable books and sell them at discount prices. This drains the profits out of independent bookstores, which many publishing observers believe play an important role in discovering and promoting promising new authors. Publishers have also been consolidating, reducing the diversity in the industry and therefore the opportunity for new authors to be discovered. "At the same time, the appearance of chain bookstores, beginning in the 1970s, has been devastating to independent booksellers.... I'm also concerned about the significance of independent booksellers in the larger scheme of things - how they discover new books that the chains often miss; how they support unknown writers; how they cultivate audiences of readers and writers, how they aren't comfortable with the kind of "paid placements" that bring Amazon.com, Barnes & Noble and Borders hundreds of thousands of dollars; how they continue to play a key role in the preservation of literature, even though they are routinely dismissed by mainstream publishers as powerless. "Well, how powerless is this: Taken together, independent bookstores offer a wider range and variety of titles than do all chain stores put together." The decline of the short story market. There has been a lot of angst in literary circles over the declining market for short stories. Short stories were once the training ground for many new authors, and some authors specialized in them. But since at least the 1980s, magazines have been reducing the space they devote to short stories, and short story collections don't sell as well as novels (according to a study conducted in the UK, short story collections sell about 1/3 to 1/4 the volume of novels). "The conventional wisdom is that magazines are bowing to the realities of necessary advertising revenues, which put pressure on sections that don't perform based on reader feedback. As a result, the inclusion of fiction in commercial magazines has become an exception to standard procedure. The number of available outlets for short fiction has been steadily shrinking, from The Saturday Evening Post to Redbook to Cosmopolitan, which still publishes excerpts occasionally, to Mademoiselle, which ceased publication in 2001. More recently, Seventeen dropped regular stories in 2003, and Jane discontinued fiction during its redesign in 2004, though both run an annual fiction contest." "Today short fiction is confined to an elegant ghetto: the New Yorker, the Atlantic Monthly, and Harper's. There still exist many literary magazines, but these publish seldom and have few subscribers. Moreover, outlets like the New Yorker publish mostly established names—John Updike, Alice Munro, Joyce Carol Oates, etc.—regardless of whether they are past their sell-by dates. Some joke the New Yorker would publish a grocery list if it had Updike's name on it." I've watched the effect of this market change in science fiction (hey, this is a technology blog, of course I'm going to talk about science fiction). There were once a large number of relatively successful science fiction magazines that specialized only in short stories. A couple of them still exist, but they're not as numerous and vibrant as they once were. There are online efforts to take up the slack, but most of them pay authors nothing or a very close equivalent. One exception was Sci Fiction, an online forum of short stories funded by cable television's SciFi Channel. Unfortunately, the parent channel pulled the plug on it at the end of 2005. "Until a workable business model is created for webzines independent of large corporations funding them as part of a larger entity (like mine), it's going to be a tough sell. But what I see in print magazines isn't any better. They start very small as semi-prozines, the best get bigger, more ambitious, come out more often and then the publisher/editor (usually the same person) burns out and/or runs out of money. Flourish? I don't know. Limp on over the years, yes definitely." We're losing a lot of great fiction as a result. Science fiction authors like Arthur C. Clarke (2001: A Space Odyssey) and Robert Heinlein (Starship Troopers), are known for their novels, but in my opinion their best work was their short stories. And then there's Ray Bradbury (although he prefers to be classified as a fantasy author). I think we're missing out on much of the next generation of short story creators because they can't get paid for their work. Out of print: The amazing disappearing author. Although books from the most popular authors often remain available long after their deaths, many others fall out of print rapidly. The figure I found quoted most often on the Web is that 90,000 books go out of print every year. Barnes & Noble reports that there are about 5.6 million books in its database, but only 1.5 million are readily available from publishers. The result of this is that even well-known, award-winning authors are disappearing from view. I'll use science fiction as an example again. The late Clifford Simak is considered one of the grand masters of science fiction (he was the third author officially recognized as such by the Science Fiction and Fantasy Writers of America). He published a total of 27 novels and 141 short stories, and several of his stories won the industry's highest awards, and are considered classics of the genre. Yet only two of his novels are currently in print, plus one partial collection of his short stories. And those are available only because a small publisher has recently done a limited run of them. To be fair, I should acknowledge that there isn't a huge market for some of Simak's books (his quality was pretty uneven). But a lot of excellent stuff is available only through used bookstores, if you can find it at all. Similar situations exist for other famous authors. Galen Strickland, who has written a lot of online commentaries about famous science fiction authors and their best-respected work, searched for copies of all the books he had referenced in articles on the website Templeton Gate. He found that of 996 books mentioned, almost half were out of print. Strickland pointed out that even living authors have problems with books going out of print – for example Arthur Clarke's The Fountains of Paradise, which won the field's two highest awards in 1979, is not currently in print. Some people in the publishing industry complain that used book sales, especially those facilitated by Amazon.com, are undercutting the sales of new books. It's hard to quantify the real impact of used books (estimates of used book sales range from $800m to $2.2 billion a year), and some studies say the cannibalization of new book sales by used books is low. But even if used books do affect the demand for new books, until the industry does something about books going out of print I don't think it'll be in a position to say anything negative about the used book economy. Generally, authors go out of print because there isn't enough demand for their work to justify a print run. It's uneconomical to do a print run for a small number of books, and besides most bookstores won't stock older books, especially if their authors are dead and no longer generating new fans (remember, the point of the system is to shovel fresh dirt into the gold sluice). One way to address the print run problem is print-on-demand technologies, which produce short print runs of books that have been encoded into electronic files. The printing cost per book is about double that of traditional printing, but the shorter print runs mean less inventory risk. One of the leaders in this space is Lightning Source, an on-demand printing service that claims to have more than 100,000 titles in its library. Authors can self-publish via print on demand through services like iUniverse. Although print on demand helps with availability, there's still the problem of getting books onto bookstore shelves. And the economics of publishing continue to eat up most book revenue – for example, an author selling through iUniverse gets 20% of the net proceeds for the book (after the costs of printing, shipping, and bookstore discounts are taken out). That's not much different from the payback from traditional publishers, which at least pay royalties based on the gross revenue from the book, not the net. There's a good discussion of the whole print on demand situation here. Add it all together, and here's how the publishing situation looks. Book publishers are not feeling as much financial pressure as music publishers (major publishers' revenue was up about 2.8% year over year in 2004, although book unit sales were down fractionally). But the diversity of books is suffering as channels and publishers consolidate. There's a serious problem with books going out of print, and the short story marketplace is moribund. And hanging over it all, the gross inefficiencies of print publishing prevent most of the money that you and I pay for books from ever reaching the people who write them. Our favorite authors don't have as much incentive, and freedom, to write as we'd like them to. The situation seems ripe for ebooks. Not only would they allow a much higher percentage of book revenue to reach authors, but once ebooks are a standard no book need ever go out of print again. The only restraint on diversity will be our ability to sort through all the ebooks that are available. And I personally believe that a properly functioning ebook marketplace could revive the short story market, by making it possible for people to purchase short stories directly at low cost. (In fact, Amazon is experimenting with paid short story downloads). However, most of these problems have existed for decades. People have been talking about ebook-like products for at least 30 years. And yet while sales of emusic are exploding, sales of ebooks poke along at a rate of growth far too low to change the industry. The ebook market simply isn't taking off. There are two main reasons, one technological and one structural. The technical problem is that, for most people, reading long documents on a computer is unpleasant. I know, you read weblogs and news online. So do I. But most of us do so in relatively short sessions, taking breaks and doing other things in between. Unlike those short reading sessions, the ergonomics of reading a book on a computer are uncomfortable for a lot of reasons. The first problem is the screen. A piece of paper is reflective – it's only as bright as the room around it. A computer screen is transmissive – you read it by the light that shines through it. To be read clearly, a computer screen has to be substantially brighter than the ambient light around it (that's why most computer screens are hard to read in direct sunlight). This excessive brightness produces eyestrain when you're reading text for a long period of time. If you're like me, you can't read a computer screen nearly as long as you can a printed book. Contrast ratio is also a problem for computer screens. If you look closely at the on-screen text in a word processing document, you'll see that it's not really black and white. The text is fairly dark gray, and the background is a bluish-slate color that you'd probably call light gray if you saw it on a piece of paper. Speaking as an old printing fanatic, it's been well established that people read most easily when they have the highest contrast ratio between white paper and black ink. Dark gray text on a light gray background is not at all ideal for reading. And the computer's readability gets even worse if there's any reflection off the screen, which is pretty common unless your lighting conditions are perfect. Screen resolution is another important issue. Speaking from my printing background again, most people can read English (and other Romance languages) most efficiently when text is written in a serif font like Times Roman or Palatino, as opposed to a sans-serif font like Helvetica or Arial. The pattern of thick and thin lines in a serif font, and the little hooks at the edges of letters (called serifs) help our eyes quickly recognize letters and words. To accurately reproduce the serifs and line thicknesses, you need about 300 dots per inch, or the resolution of an early laser printer (600 dpi is even better, and the printing standard is 1,200 or 2,400 dpi). Most computer screens are about 80 dots per inch. Text is readable on them, but not nearly as readable as it would be on a piece of paper. The result, once again, is more eyestrain and slower reading speeds. Despite all the drawbacks of computer screens, I think they're not the biggest barrier to ebook adoption. When I was at SoftBook, people sometimes complained about the screens, but other issues were a much bigger problem. You can't use a computer the way you use a book. There are general ergonomic problems with reading on a computer. If you're using a desktop computer, you have to hunch over a desk in an office chair, rather than sitting back in an easy chair or couch the way most people do when they read a book. You can read from a laptop, of course, which makes it easier to sit in a comfortable spot. But laptops have their own problems. The batteries don't last all that long, so your laptop may hibernate just as a book comes to a thrilling climax. Laptops are much heavier than books, so they are hard to hold comfortably. And they get disturbingly hot when used for hours (like the one that's trying to scorch my thighs right now). Goldilocks and the two tablet devices. Then there are the two leading alternate mobile devices – tablet PCs and handhelds. Neither of them make great e-book readers for the average person. Tablet PC is basically a PC with the keyboard sawed off. It's still quite heavy compared to a book, so much so that you can't hold it by the base the way you would a book (your wrists will wear out rapidly if you try). Instead, you have to prop it against something, which puts you back into the wrong ergonomics for most readers. And it has the same battery life and screen problems as a portable computer. I had hopes that Microsoft's new shrunken tablet design, code-named Origami, would give a better experience. But press reports say it's going to cost $800, weigh two pounds, and will have short battery life. To me that's just another tablet PC. At the lighter end of the hardware scale, ebook reading software has been available for years for handhelds, and it's now moving to smartphones. There are people who read ebooks on handhelds (I'm one of them), but unfortunately it's not the right platform for most people. The screens are just too small for a comfortable reading experience. It's great if you're trapped on an airplane or bus and have nothing else to do, but there's no way it substitutes for a printed book for most people. There's a nice discussion here on the problems of reading on a small screen. So I find myself feeling like Goldilocks – the Tablet PC is too big, and the handheld is too small. I need something with the thickness and cost of a handheld, but the screen size of small tablet. Chicken and egg. But even if that hardware were available, it wouldn't be enough to make ebooks succeed. 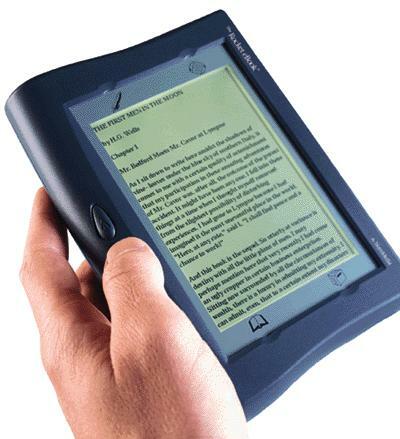 After all, the Rocket ebook reader came pretty close to the right size in the year 2000, and it went out of business. --1. Most dedicated book consumers, the core customers for ebooks, won't buy an ebook reader device until there are millions of affordable books available for it, including a lot of current titles. I saw this one first-hand when I worked at SoftBook. --2. Most publishers won't make their books available for an ebook reader until it has an installed base of millions of units, and they won't price them at paperback price points unless forced to. This dilemma broke SoftBook and Rocket Book and every other attempted ebook reader launched in the last decade. And I think the new ebook readers being developed by Sony and Philips are at grave risk for the same reason. Even a world full of PCs and handhelds and smartphones equipped with ebook software is not going to change the situation. If they were acceptable reading devices for most people, the revolution would have happened already. Emusic vs. ebooks. Looking at all the barriers to ebooks, it's interesting to ask why emusic succeeded. A lot of people try to draw parallels between the two markets, but in fact some critical factors are very different. 1. Content was available for mobile music devices from the start. There were two sources of emusic: pirated MP3s, and CDs owned by the customer. Remember Apple's old "Rip, Mix, Burn" campaign? Even before the iTunes store was fully stocked with songs, you could use an iPod to do something interesting and useful with your music, just by ripping your CDs and transferring the music to the iPod. That helped to jump-start the iPod market. 2. Fear of piracy made the record companies deal. The record companies were so fearful of piracy that Apple was able to talk them into selling singles for 99 cents each – something they never would have agreed to if customers hadn't been stealing the songs for free. This allowed Apple to assemble a very large library of affordable songs. Because of the special conditions in the music market, Apple managed to give birth to both a chicken and an egg at the same time. Unfortunately for fans of ebooks, the conditions Apple took advantage of don't apply in books. There are no book CDs that can be ripped and burned to an ebook reader, and there is no large-scale book piracy problem that would convince the publishers to make their books available at paperback prices. In fact, they have a strong incentive to keep the ebook market just as weak as it is today. Our challenge. If we want to see ebooks really take off, we have to find some way to get a well-designed ebook reader to into the hands of about 20% of book buyers, before it has a critical mass of first-run ebooks available for it. I have some ideas on how to do it. That'll be the subject of my next post, in about a week. ** This is why I think Google's Book Search program, formerly called Google Print, was one of the most strategically bone-headed moves made by a Silicon Valley company in the last five years. By asserting the right to scan books and post excerpts from them without prior authorization, Google managed to do the seemingly impossible – it got the authors to make common cause with the publishers. That's like getting the National Rifle Association to partner with People for the Ethical Treatment of Animals. Way to go, Google – in pursuit of the niche of searching scanned library books, you screwed up your ability to move the entire publishing industry to electronic format. Although it's several years old, this is a splendid essay by Berkeley professor Clifford Lynch on ebooks and all their implications. Mobile Read (a discussion forum on general mobility topics, but with a special focus on ebooks). Weblog of Bill McCoy, who works ebook issues for Adobe. He sounds more optimistic about the short-term prospects than I am. Thanks to the latest Carnival of the Mobilists for linking to my post on technology predictions. This week's Mobilist edition had a number of interesting articles in it; it's worth checking out. Posted by Michael Mace at 11:51 PM Permalink. 21 comments. Click here to read post with comments. Interesting post. Being an aspiring *book* author, you seem to focus on the mass market for books. I had a few thoughts while reading your post. The overall publishing industry excels at serving niches, so I think it is easier to be optimistic about change if you break down the challenges. Maybe ebooks are not the answer to every problem? Why would *anyone* pay hardcover prices for an ebook? The upper limit of comparison would seem to start at paperback, not hardcover. To even start talking about ebooks as a direct replacement for hardcovers makes me think a very big jump in logic has just occurred. Why not start the discussion by looking at ebooks as a replacement for paperbacks, or perhaps even certain types of paperbacks? I don't think consumer will change to ebooks for everything they read--at least not initially. Perhaps they will buy ebooks for trashy romance novels they would normally read and discard. For reference works or books they want to display on their shelves, the threshhold for converting to ebooks may be much, much higher. Of course, maybe it works the other way around? Doctors and lawyers may like to carry around an extensive library, but those are niche markets. (Despite the number of lawyers, they are still a niche.) These buyers might even pay a premium for ebooks, but you would need whole libraries of content. Still a chicken and egg, but a set of smaller chickens and a smaller eggs--for a series of specialty markets. That sounds like what the publishing industry is good at. There are a lot of inefficencies in the publishing business that, if addressed, might make hardcopy books more attractive. Some problems, such as the ability to return unsold inventory, are easy to get one's hand around, while others, such as printing technology, are more complex. The whole out-of-print problem seems to be a technology problem for which eBooks are merely one potential solution. It seems that LightBridge and iUniverse type processes have a lot of potential. Print-on-demand and drop ship change the buying process, but also eliminate the (big) inventory and returns costs. There might be a new merchandising / selling paradigm to solve that problem. Maybe there are ways to electronically browse books before custom ordering a print-on-demand copy. Maybe there is a fortune to be made in 1-hour book publishers? Regarding independant booksellers and their role in discovering new authors, some of that void is being filled by bloggers--either pure bloggers or bloggers-turned-authors--like you! Certainly bloggers are not filling the hole at the same rate as it is being created by the demise of the independant bookseller, but blogging is still relatively new so we have to give it time. Hey, Mike. I've been an ebook fan for several years, and last fall, I switched my long standing paper subscriptions of SF magazines Asimov's and Analog from paper to e-format through Fictionwise. I've probably been about 50% paper/50% e-book in my fiction purchases in the last few years. My biggest disappointment right now is in the lack of innovation in the main ebook reader applications. I primarily use eReader Pro on my Treo 650; it has a very nice basic feature set. However, it's never implemented good support for reading a large library of books off of a SD card, it's support for fonts is pretty limited, and the UI hasn't been adjusted to handle five-way navigation. Basically, aside from a few small bug fixes, the app's been abandoned since PeanutPress was sold to Motricity. This really bugs me, since because of book DRM, this is the only reader I can use for many of my titles, and its limitations have discouraged me from buying more books in that format. >>Being an aspiring *book* author, you seem to focus on the mass market for books. Books have always been the Holy Grail for the electronic publishing world. But in the next post I'll talk a bit about electronic newspapers and magazines. Also, I had to focus the post down on something. It took forever just to write the ebook thing; if I had tried to do all of publishing I might not have finished before June (and June of what year, I'm not sure). >>Why would *anyone* pay hardcover prices for an ebook? Most people absolutely would not, which is why it's distressing to see many publishers insisting on charging hardcover prices for ebook editions of their products. That drove me nuts at SoftBook. I know why they're doing it -- they want to protect their retailers. But that kind of tells you where their priorities are. >>Why not start the discussion by looking at ebooks as a replacement for paperbacks, or perhaps even certain types of paperbacks? Cool, this is the sort of discussion I was hoping we'd get. There are a huge number of permutations on the market that are worth exploring. The more I think about it, the more I cook up. I did mention the possibility of the ebook taking the place of the paperback, but I didn't spend much time on it. I could see that approach working from a customer perspective, but it's hard to figure out how it would work for the publishers. Once we reached critical mass on a paperback ebook business model, there's no way an author would accept getting only 8% of the revenue from their paperback editions -- especially an author who's popular enough to merit a hardcover release. So they'll want to bypass the publisher for the paperback edition. How many publishers can survive on only hardcover revenue? And how many bookstores? Definitely some of them will survive -- I think there will always be a market for words on paper. But my gut is that when ebooks do hit the tipping point, the current book infrastructure will fall pretty fast and hard. I think the current model in which the publisher carefully manages the hardcover release first, and then the softcover, is going to be very hard to maintain among all the flying wreckage. That one's already happening, although in many cases the content is not even labeled an "ebook." It's just reference information that you can carry on your device. ePocrates is a good example. But because they're niches, these wins don't really affect the book market as a whole. Even if you add up all the niches, I think they're not enough to get ebook readers into the hands of 20% of book buyers, which is the goal I'm shooting for. >>Maybe there is a fortune to be made in 1-hour book publishers? Maybe, and I think you're asking the right sort of questions. I'm a little jaded (maybe too jaded) about the print on demand thing because it has been talked about as a panacea for years, and yet it hasn't had nearly the sort of impact people predicted (sounds a lot like e-books themselves). When I try to think through the scenario of a bookstore with an in-store press that turns out a book while you wait, it reminds me of some of the very early automobile designs that had a fake horse's head on the front of the car, so they'd blend better with he existing carriages. I wonder if sometimes we aren't trying desperately to use technology fixes to patch up a system that's fundamentally obsolete once ebooks finally take off. Here's a thought experiment -- if a blogger is playing the role of a bookseller in finding and publicizing great new books, is there a way for the author to reward that person (similar to an Amazon referral fee, but from the author)? Or would that inevitably corrupt the bloggers? >>I switched my long standing paper subscriptions of SF magazines Asimov's and Analog from paper to e-format through Fictionwise. I did something similar, although in my case I bought the discounted yearlong compilations of the magazines. Note to the magazines -- I was not a subscriber before that, so your e-distribution got you an incremental customer. I found that the magazine compilations are great for plane flights and whenever I'm trapped someplace boring. >>My biggest disappointment right now is in the lack of innovation in the main ebook reader applications.... This really bugs me, since because of book DRM, this is the only reader I can use for many of my titles, and its limitations have discouraged me from buying more books in that format. I haven't run into problems with the client, probably because I'm clinging to an old Clie that still has more features than almost any other device on the market. But you raise one of he important fears that people have about ebooks -- what happens if my supplier goes out of business and I'm stuck with ebooks that I can no longer read? Excellent post as always, and on a great topic! One of the best things about your perspective and comments is that it always proposes a nice framework for thinking about the situations, and gives new life to what has often been a tired subject. I think this is where the mass market is for e-books. There surely are niche markets for reference works, and I do think they can be profitable, but as you say reference works are not likely to single-handedly determine the direction of e-publishing. The great advantage of paperbacks in the mainstream is that people usually want to read it and then don't care as much about keeping it in their libraries. So DRM isn't a show stopper. It may prevent people from building up libraries in advance, but one by one it's no big deal. On the other hand, it can be a real problem, though, for materials like Bible reference works. Those are preferably life long purchases, but DRM and reader lock-in produce the opposite effect. I have that same concern with many of the books I've got in eReader format. I like eReader, but I don't want to lose all the content I have. I want to keep those books that I haven't read, as well as a few of my favorites that I have finished. Because of this problem, many people resort to buying in .lit format (Microsoft Reader) which is one of the worst DRMs due to limited activations, and customer support problems if the activations are lost. People don't buy in that format to use Microsoft Reader (which also is not on PalmOS). They buy it because they can break the DRM and then feel more secure that the book is theirs long term. I'm not saying it's right, I'm just saying it's a superior solution for the user at the moment, so it's a common approach by the savvy user. Fortunately, those are generally serious ebook buffs, not pirates. In your analysis, there's not a lot of focus on the technology (you can't focus on everything), but I think the technology is a big factor. The whole eBook vs pBook tipping point is not just about availability and trends. It's highly dependent on the eBook experience which is lacking right now. It's probably better on handhelds than laptops or desktops, and you can have the books with you at all times, but it's still on a marginal quality and tiny display. UMPC might help a bit if it ever catches on, but won't make a big splash in eBooks for a while. * Has anyone looked at chaos theory in relation to social sites and product marketing? It seems almost random sometimes when we look at what becomes popular. It's hard to tell if just the right people talked to the right friends, or the right post was made somewhere, or if it was perfect marketing, or if something caught on because it was just that good. Who was that guy on the TV singing show that did the horrible rendition of the Rikki Martin song, but got famous from it?! For both music and eBooks, we will have all those nice sites helping us find what people like. But sometimes I wonder -- are very tiny events able to sway the collective popularity of content, the same way a single butterfly or traffic light across town can significantly affect traffic flows? * DRM and eBook technology has a huge FUD factor right now. In mp3s, once people started ripping CDs and buying music online and using iPods, the word spread, and people didn't have to be innovators anymore to enjoy mp3s like we pda fans have been doing for years before the iPod. Same thing for eBooks, but there's a huge difference... no ready-made source of content already available. You can't scan books easily like you can rip CDs. About the closest you can get is Project Gutenberg. Ebooks really have to get much simpler to use before the public will want them. And even then, they need to have their neighbors (the early adopters) show them how to do it. * The eBook experience needs to be better. People are going to miss holding and smelling real paper if all they get with eBooks is a headache, tired eyes, and the same sort of pain-in-the-neck that keeps them away from spending their spare time on the computer or pda. Displays and nice standalone devices are coming and will push this tipping point that much closer, but I don't think they take all the frustration and required learning curve away. Plus, what are the additional features that people are getting for all their trouble? Searchability and large libaries in their hands? I don't think that's enough. The experience itself has to be pleasant, simple, and trouble-free. With books people don't necessarily immediately know what they want to read like they know what they want to listen to. Part of the book choosing experience is walking through a bookstore (brick and mortar or online). It's not that hard to pick music because you browse your favorite artists or the latest album you already know about. So the ebook thing is hard even before you talk about getting the book on the device! Now don't get me wrong. I love ebooks, especially on my handheld because I can read whenever I want, and I like the choice of fonts and being able to read in low light, etc. E-ink book devices are going to be nice in the future also (if they don't just become part of another convergent device like a UMPC, that is.) I think it's the only way to go. I just think that we "experts" tend to forget how intimidating the steps are for a non-techie. We forget that the process of picking, acquiring, loading, and viewing a book is not inherantly as simple as an iPod, and until the supporting infrastructure and interfaces come, it is almost nightmarish for the novice non-tech user. * Old non-copyrighted eBooks are great reading. Not everyone likes the classics, but it's a big factor in differentiating the music and book markets. Some of the best books are the old stuff. You need to be a bit more sophisticated or educated or at least diligent to get through some of them, but they're great. Old music (and movies) are, well, either non-existant, very bad, or still under copyright. That means that there's a huge niche market for people wanting to read public domain ebooks. I believe that it really affects our estimation of the future in odd ways. We often think it's a sign of ebook adoption, but in fact it's a misleading indicator because it's not the same market that leads to the tipping point. As always, I'm typing this off the top of my head, so hope it is at least clear enough to be somewhat readable. Hope this adds some interesting thoughts to the discussion. Can't wait for your next entry. What a great job you are doing with this blog. I'm sure that your following will grow and grow until you're consistently viewed as one of the big guys, not just due to your role in the mobile industry, but because people in the popular business press find you an interesting thinker and communicator. Maybe that butterfly will flap at just the right time and your book will be a best seller at the end of this exercise. Thanks for sharing it with all of us! Nah, it really is about the technology. ebooks are fragile, difficult to cope with and run out of batteries. paperbacks i can shove in my pocket, let get a bit wet, and read without worrying about electricity. I've got access to over 17,000 free project Gutenberg ebooks, many of which are titles on my to-read list, and yet i'm far more likely to check the book out of the library than read it in e-form. Of course, you concentrated on ficton, and the story is even worse for non-fiction. I absolutely hate typesetting mathematics, but I loathe reading them on line. I'm glad you brought up DRM. I ducked the whole DRM subject in my post, because it's ugly and complicated. In my experience, the fears about DRM for ebooks are much greater than the actual problem is. If you ask the publishers what level of DRM they need, you'll end up designing something grandiose like Microsoft's scheme. But in practical terms, all you really need is a social mechanism for identifying who's stealing books. I think the old Peanut Press approach of encoding the user's name into the book is a good one. That plus an occasional enforcement lawsuit would probably be good enough to intimidate most potential pirates -- as long as the prices for ebooks aren't set too high. If the publishers try to charge $20, then yeah there will be piracy no matter how complex the DRM scheme is. I get the feeling that the publishers are more concerned about tight DRM than most authors are. A lot of the authors seem to be willing to take more piracy risk to get their books more broadly distributed. The Cory Doctorow essay that I linked to in my post is a good example. Maybe the authors are less scared of piracy because they're not making much money from their books anyway. If the royalty rate went up, they might start to care about DRM more. >>The whole eBook vs pBook tipping point is not just about availability and trends. It's highly dependent on the eBook experience which is lacking right now. Agreed, and I'll talk more about the upcoming ebook hardware in my next post. The point I was trying to make was this -- beter technology is a necessary but not sufficient condition to make ebooks take off. In Silicon Valley we tend to think the right device can overcome any barrier, but I seriously doubt it in this case. The SoftBook hardware was acceptable to a lot of people; it was the lack of a huge library of current books that killed us. >>Has anyone looked at chaos theory in relation to social sites and product marketing? Cool idea! I hadn't looked at it that way. >>We forget that the process of picking, acquiring, loading, and viewing a book is not inherantly as simple as an iPod, and until the supporting infrastructure and interfaces come, it is almost nightmarish for the novice non-tech user. I agree completely. You have to work the whole solution if you want normal people to use your product. I'm glad you mentioned Project Gutenberg. I first discovered them when I was at SoftBook, and I think what they're doing is very noble. Unfortunately, a great library of classics isn't enough to drive the ebook adoption rate we need, but it's a good start. I think the more important thing is that their work is just intrinsically good for humanity. Some very interesting additional thoughts there, especially about the DRM issue. "If you ask the publishers what level of DRM they need, you'll end up designing something grandiose like Microsoft's scheme. But in practical terms, all you really need is a social mechanism for identifying who's stealing books." Excellent point! People who are determined to steal books have many avenues for that anyway, including physically scanned copies. But the average consumer would rather just pay a fair price for a convenient product. But publishers seem to want to maximize profit per book sale, not overall revenues. Partly because they are protecting print sales, as you pointed out. But partly because they are so anxious to lock down the DRM, they are willing to sacrifice ebook sales. No to mention that if they have tight DRM, they can probably resell content to the poor consumer over and over again. The gentler DRM would accomplish the same goals, but you have to convice the content owners... they are the ones that have to be satisfied first, not the customer. "I get the feeling that the publishers are more concerned about tight DRM than most authors are." Yes! Except a few like the Harry Potter author, maybe. There always seem to be two sorts of sellers. One type are those that hold tight to everything they have and want to squeeze the most out of it because who knows what the future brings. Legal avenues and DRM are a good way to hold on and protect. And the other type are those that hold loosely what they have, aiming to innovate and bring the customer what they want, and continue to add value. They make their future by providing something people want, not by squeezing the coins out of their pocket almost against their will. Similar to consultants. Some consultants want to charge for every single piece of code, home grown utility, or even ideas that can be expressed in a single sentence. They feel that their whole value is wrapped up in those things so they are careful to protect them. But the more successful and useful consultants are very open with those sorts of things, and gladly offer those one-minute solutions for free. They figure that the real worth they can offer is of ongoing value, and they find their revenues from happy customers because they continually apply their knowledge creatively to get things done. They don't have to nickle and dime you to death. I guess that's a bit off track, but the point is that there are two general approaches to selling, and I think we are seeing that the paradigm for publishers is based on fear and tightly holding content. There are only a few lone voices like Cory and Mark Cuban and and handful of others that take the generous and yet successful "bring value" approach. In ebooks, people are becoming used to a different type of quality than for pbooks. It's similar to how people are now becoming more accustomed to good music with lower quality production standards because of the increased availability of amateur bands and the lower quality encoding and playback used with many common mp3 players. But with ebooks, you have many who are gladly reading books (even from major ebook publishers) with scanning errors, terrible layout, maybe even text only. Why is this important? Because it may remove one of the last remaining reasons for existance of the old guard publishers (and all the overhead) after we get to ebooks. * Editor input and guidance, and professional layout and production, and other logistical support - This is probably one of the most talked about "values" of the publishing industry that distinguishes "good books" from the do-it-yourself-hacks. You hear about it all the time from publishers, and they are convinced that books might as well just disappear if you don't have it. Customers on the other hand, don't seem to care. Yet the publishing industry has a blind spot, because they are convinced that their work is so important that the customer wants it and needs it, and just doesn't realize it because he's so stupid! But my thought here is that the consumer really and truly doesn't care very much about this, despite what the publishing industry tries to tell us. Amateur quality really is good enough for most mass market books. No amateur writers, but amateur editing and production qualtiy. Maybe for special works like textbooks or reference works, and always for some of the cream of the crop elite books. But it's sort of a point of pride in the publishing industry that may have lost touch with reality. In general, I don't care if I read a best seller that's basically text-only without any special layouts. I don't care about the occassional misspelling or grammatical error. I don't care about a lot of things that are life and death to an editor and publisher. Do those things matter? Yes, I admit they do. But not so much. We are happy with good content in our novels. We even are becoming accustomed to those errors in our ebooks from major sellers. If I want great literature, I'll read the classics. If I want to have a quick fix, I'll read something to have fun or learn something quick, but I don't care too much how it's packaged as long as I can get what I need efficiently and enjoyably, and as much as top notch production quality might help, I don't really believe that I care that much about that kind of quality. I want an effective author and writer and topics I care about. Good enough for me, and good enough for 90% of us I'd say. That means top notch production and editorial efforts will become focused in other areas. Maybe some niche books, online newspapers and publications, etc. Or for the "sure thing" best sellers that make this overhead a smaller pctg of revenues. Who knows? In a way that's sad that I'm predicting quality will suffer in mass market ebooks, but it can sure make the ebook industry a lot more efficient, and bring prices down drastically! I've been wanting a book reader for quite some time (years) and I've always held off for two major reasons. First I don't want to have a reader that is locked into a certain format. We need a standard, open format for the books and readers so we won't be locked into hardware by certain vendors. Secondly (and this is related) I've been concerned about DRM. Right now I can lend, give or sell one of my books to someone. Will I be able to do that with an eBook? I'm not so sure. We all know that when you buy music from the iTunes store to play on your iPod, it is locked to that device. Will that happen with eBooks? I'm not as concerned about content. Assuming that the format issue isn't solved and I have to buy a unit with a proprietary format (like the sony reader), if I can see maybe 10 eBooks I like I would buy a unit. I figure I could offset the risk of locking into a format enough that I could ride out the stretch before most books are produced in that format. If the hardware sells, the books should follow. But my central mystery is that it is so cheap to produce an eBook once the hard part (writing and typesetting) is done. As a publisher, why not just take a small risk and publish everything in ones catalog as eBooks (in all formats) and see what happens? Its a total mystery why it is taking so long to give the public something they clearly want. I cannot get you to 20% of the market, but I can get you to 10%....educational textbooks. This is a $2B market and textbooks are not read like novels. Students read them a little a time. They can also be written a little a time an energized consortium of faculty could re-create the entire marketplace in a couple of years. In fact, Fred Beshears of Berkeley has been talking about just such a project. There is an added advantage of getting students - who are already more technically literaate - used to the idea of ebooks - going on creating a demand market for ebooks in novels, etc. ...and too many other indicators that education is going to be the leading market segment in this revolution. More good comments. This is fun. >>they are so anxious to lock down the DRM, they are willing to sacrifice ebook sales. I think the bottom line is, they're just scared. Publishers as a group are not early adopters of technology, and all this change scares them. They're afraid they'll catch Napster disease. Google's book search initiative didn't help matters. >>Except a few like the Harry Potter author, maybe. When I was at PalmSource, we collected hundreds and hundreds of stories from users about what they did with their handhelds. The diversity was deeply impressive. One story we loved was an adult who wrote in saying that he loved reading the Harry Potter books on a handheld in the subway. He was embarrassed to be seen reading the books, and reading on the handheld meant no one could see what he was reading. We all thought it was a cute story and wanted to publicize it. But then we realized that the books had to have been pirated, and we weren't comfortable publicizing that. The lesson is not that a lot of books get pirated. It's that if you don't provide a product the way that people want it, they'll find a way to get it despite you. >>In ebooks, people are becoming used to a different type of quality than for pbooks. I think that's a really good point. And it's not just ebooks driving the change in standards -- websites are doing it too. When you give people a choice between cheap and immediate vs. perfect and costly, they'll often go for the cheap one as long as the quality's not too bad. An occasional typo or boring formatting just doesn't matter enough to justify the higher price. Anyone who shops at Wal-Mart knows what I'm talking about. >>Assuming that the format issue isn't solved and I have to buy a unit with a proprietary format (like the sony reader), if I can see maybe 10 eBooks I like I would buy a unit. Cool. I wish there were more people like you. When I was at SoftBook, we had pretty well decided that our core customers needed to be book-reading enthusiasts. And they were very sensitive to the size and currency of the book library. But if you're happy with a smaller selection of books, more power to you. Be sure to also check out the Philips ebook product when it ships in your part of the world. >>my central mystery is that it is so cheap to produce an eBook once the hard part (writing and typesetting) is done. It's not as cheap as you would expect, especially if the publisher wants to apply full print-quality attention to detail. In that mindset, you have to check for very subtle typographic effects that interfere with readability. The process can get very tricky. >>As a publisher, why not just take a small risk and publish everything in ones catalog as eBooks (in all formats) and see what happens? For the big publishers, I think it's just plain fear. >>I cannot get you to 20% of the market, but I can get you to 10%....educational textbooks. Very good point, and I agree with you. I'll cover that some more in my next post. In my post, I forgot to mention TeleRead, which is a very active site covering ebook news. It's worth checking out. I was toying with the idea of small ebooks (m books really) which can be read on a hand held, which are priced low (say $5) and offer technical information --how to do this ... how to do that...kind of stuff. I think it's a cool idea, Sam. You should check out a website called Memoware. It's a repository for a huge array of documents readable on mobile devices. It was very popular among the Palm OS crowd for a time, although I suspect traffic to it has probably dropped off as the enthusiasm around handhelds declined. I think that technical how-tos are a great subject area for electronic books, since that matches the interests of the most likely users. The trick, I think, will be finding a way to publicize the e-books without spending more money than you'll receive for them. That's a problem for a lot of mobile software publishers. Thank you Mike, for the quick reply. I came across another mobile content site called Mobipocket. Their reader claims to work on all handhelds and they also have a free publisher and site to sell the book. Have you any info or opinion about them? Also, I think they got acquired by Amazon quite recently. Hmmmm, very interesting, Sam. It looks like the Mobipocket purchase was April of 2005, which means that either Amazon just wanted a toehold in electronic book distribution, or it's been working on this ebook device for even longer than I realized. Mobipocket has the same problem that I've seen in other electronic book sites -- they're charging the same prices as the print editions of their electronic books, which is totally unexciting to most users. Not Mobipocket's fault, though -- it's the publishers trying to protect their bookstore channel. What I do not understand is, why cannot Mobipocket (or any other mobile ebook reader) also "read out loud" like an audio book? After all it is a "phone" well designed for audio too, isn't it? The product can be a combination book+tape. Hows the idea? I have a feeling that the limitation is the memory and battery life of a mobile device. Speech synthesis is okay on a PC, but even there it can be hard to understand. A PC has tons of storage, a realy fast processor, and is plugged into a wall. A mobile device has none of those advantages, so I have a feeling the speech synthesis on a mobile would be pretty hard to understand. You could do the speech synthesis on a server and stream the spoken words to the mobile device wirelessly, but that would be a very long phone call and you'd still kill the battery. I think the best way to get a book read to you is going to be via podcast, at least for the next several years. Thank you for the insights. But if a late gen phone came out with more memory, could we not compress a voice file into a smaller size and stream it alongwith the text? Also, now that the iphone is out, what does it mean for mbooks? Or since they will not allow any 3rd party apps at all, there is no opportunity at all? author of Dating Bytes: An Average Joe's Guide to Internet Dating! via Publish America 2007. I believe it would be very difficult to sell eBook's on a per unit basis. I recently read your corresponding article on music. You made the point that while singles sell well on iTunes you believe that whole albums do not. I believe there is a boundary around 1 dollar above which there is a strong reluctance to purchase anything that does not have a physical presence. What I do believe would work well for eBooks is a subscription based model that gives access to an extensive library for a monthly fee. Services would compete for the first runs of bestselling authors. The whole business model would look a lot more like satellite radio or pay TV than traditional publishing. Further down the road there is a need to look at what happens to our public library system. Should these public $$'s go into some sort of online distribution network delivered via municipal WiFi to replace the stone structures. Also with skyrocketing textbook prices and the fact that many go out of date after only one year eBooks might be perfect for students. This would work great if the textbook cost was rolled into the tuition costs and all students had online access to all reading materials for the current semester. This would keep royalties simple as it would be a factor of the number of students enrolled in a given class. Piracy should not be an issue since students would be charged each semester. This should be reason for sunstantial discounting of textbook pricing since everyone pays up instead of large numbers of students buying used textbooks. As an ebook reader I think that more and more people are reading ebooks than in the past thanks to the Ipad and some other tablets for many reasons like economy, for instance, but I still love to read an actual book and if it is a little old, I kinda like the smell and to feel the sheets in my hands (I know it sounds weird LOL), but that feeling will not be taken it away by ebooks ever in my opinion. An idea I have and shared with some friends is that most likely...the future of the book marketing will be to sell the original and actual book with a copy in electronic version (PDF) and an audiobook too narrated by the author or a decent book narrator, all on a DVD. I think that it would be very interesting to listen to the words pronounced by the same author of the book and to see if our reading of the words is alike or different.